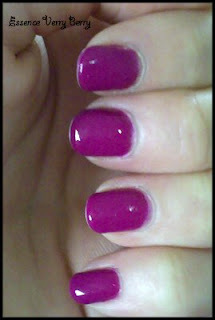 NOTD: Essence Very Berry (Jelly baby LE) - Cherry Colors - Cosmetics Heaven! 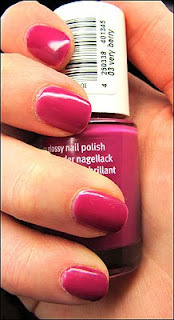 For all of you who asked how does Jelly baby look on nail, here's a picture. Of course mine isn't exactly the same as the one you'll get, because mine is from the Jelly Baby LE, and the one in the giveaway is from the Show Your Feet edition. Which is more pigmented (yay! ), longer lasting and antiseptic. Excuse me the white tips, but I reshaped my nails and now that they're more square like, the white tip shows quickly. Plus I don't like them this way. Nope, too chubby! I am not holding the bottle, because I was at my bf's place and well I left it at home. How do you like this color? I think that in RL it is a bit warmer than on the picture. But still, pretty realistic. EDIT: Almost a year later and with a better camera here are some new pictures! Weird. Outside it's very warm toned (I love it) and inside it is a bit more cold toned. So outside it's more like the new pictures and inside like the old picture.